Chaka Chandler is just big. Big in stature, big in personality, big in reputation, big in heart. And big in voice, too; you can hear him booming from across the room. Chaka remains a sports buff, particularly a diehard fan of his Ohio State Buckeyes. But as far as pro teams go, it’s the Browns, the Yankees, the Blackhawks and the Bulls. Out of college, he worked for a time at a sporting goods store, but soon got into radio sales and TV sales, before doing color commentating for a station in Mt. Vernon, Ind. Chaka had friends from school and home living here in Key West, and so he visited often throughout the years, his good friend John Neal, in particular. Once, at a football game in Columbus, he met up with friends Terry Worthing and Corey Hankins, who told him, “You need to come down to Fantasy Fest.” He ended up moving here and spent from October to February couch surfing with his two Rottweilers. He began work by doing security at the Lazy Gecko on Duval Street, and then returned to radio and TV, partnering with Bill Hoebee. “Hoebee did the news and I did sports. We interviewed a lot of local celebrities and political figures.” Before long, Chaka was found himself doing less and less security and more and more DJing. From his college days on, Chaka has been a musician and promoter in his own right. He’s currently working on getting his piano and guitar chops up to speed again and looks forward to working with other local musicians soon. 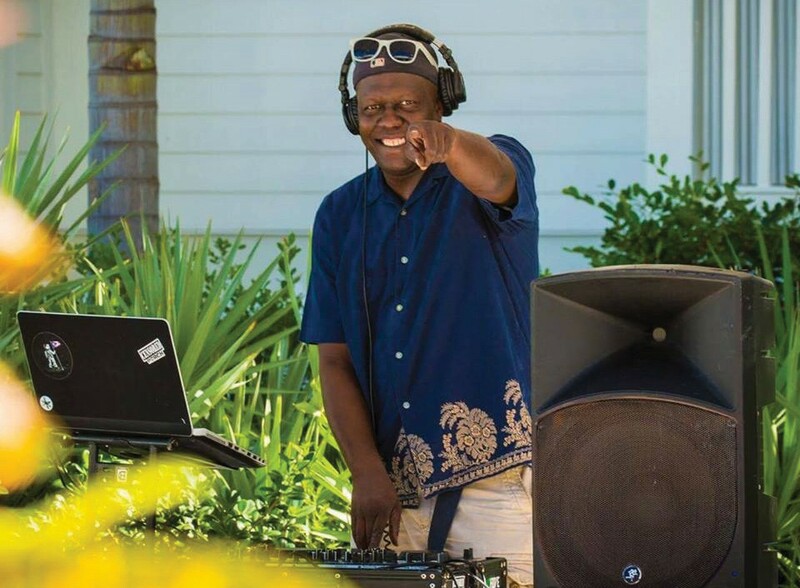 Chaka has been hosting the Dante’s Pool Party from noon till 6 p.m. for a few years now, and isn’t shy when it comes to posting pics and videos of the curvy patrons who are enjoying the beats he’s laying down. Dante’s Pool Bar is a favorite hangout for locals, particularly during Happy Hour, Monday through Friday from 4:30 till 7:30 p.m., when you can get Buy-One-Get-One domestic beers, well drinks, Fireballs, Jamesons, lemon drops, and several other drinks and shots. Also, three for $2 raw oysters, clams and peel-and-eat shrimp, $5 wings, bang shrimp, hot pretzel bites and jalapeno poppers. Often, you can scarcely walk without bumping into a bikini-clad girl, in or outside of the pool. Dante’s offers a full menu for your poolside pleasure, including soups, salads, appetizers, a raw bar and dinner entrees, along with a variety of frozen drinks. For just under $9 per person, they will also cook your fresh catch for you, prepared one of three ways: fried, grilled or blackened, with a choice of various side items. Besides hosting the Dante’s Sunday Fundays most Sunday afternoons, Chaka is upstairs throwing down the dance party at Rick’s on Duval Street from 8:30 till close (usually the last place to shut down on the 200 block), Fat Tuesdays three or four times a month, and poolside at the Marker, where he’s celebrating his one-year anniversary spinning this month, on Fridays from 2 till 5 pm, with Happy Hour starting at 3:30.